For a long time, Star Fireworks have been THE company that light entertainment and reality shows turn to when they need fireworks. No-one has more experience of live television situations involving fireworks than we do! From initial approach, we will work with your production team to understand your concept. We’ll make suggestions along the way and share our vast knowledge and experience to give your director exactly the ‘look’ they’re after. Most of our television production work is short notice. We are happy to carry out site visits free of charge to help with your planning. We are well know throughout the industry for our affordable rates and ability to stay on budget. Television highlights include fireworks and special effects for every series to date of UK Big Brother since 2002, The Only Way Is Essex, Sweat The Small Stuff, Blue Peter, Derren Brown, Million Pound Drop, BBC Children In Need, This Morning, Tycoon, Celeb Air, Justin Lee Collins Show, Shattered and GMTV. Our teams have worked at such iconic studios as BBC Television Centre, The London Studios, Pinewood Studios, Elstree Studios, Shepperton and The Riverside Studios. Work on Big Brother starts early, before the show even goes on air. Our designers work with the show producers and directors to choose effects, firing locations, plot camera angles and plan cues. Every time a winner leaves the house they are greeted with a huge firework display, pyros all over the house and set and stunning blasts of glittering confetti showering the audience and set. 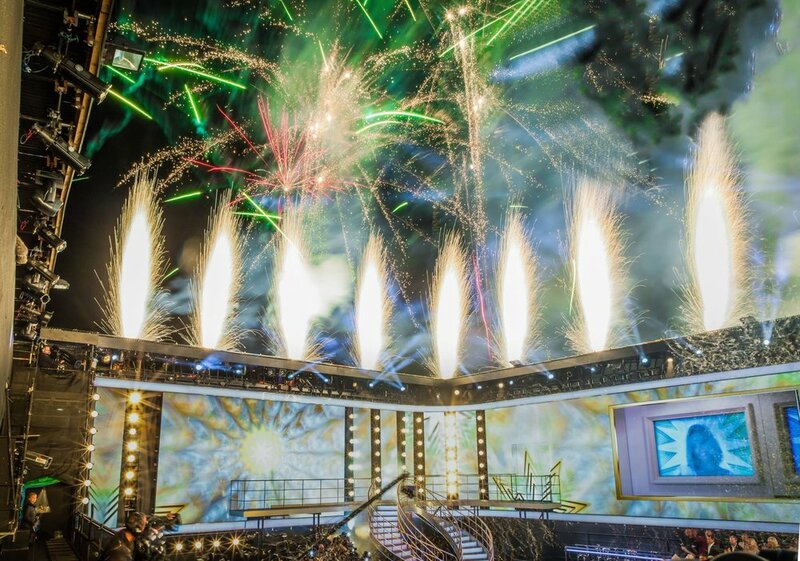 We don’t just produce the fireworks though – Star Fireworks also produces special effects sequences for Big Brother tasks and launch shows, as well as the studio based show Big Brother’s Bit On The Side . Over the years we’ve blown up statues, exploded boxes of dynamite, lit up pyro fountains for a knife thrower, blasted confetti for a Big Brother funeral and we’ve even produced thrusters for a spaceship which descended into the Big Brother garden! For the spaceship we attached illuminated CO2 jets to the underside of the 3 x 2 metre spaceship which was suspended by a crane 60 metres above the garden – with our operator pulsing the jets as it came in for a night landing live on Channel 4. — Celebrity Big Brother Producers. Continuous product development, new firing locations, the latest technology and our excellent relationship with the show producers means the fireworks continually evolve. 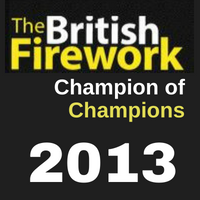 Every winner since 2002 has enjoyed a spectacular display from Star Fireworks. Contact us for T.V. fireworks. Star Fireworks at Carfest with The Kaiser Chiefs raising money for BBC's Children In Need. Pyrotechnics and concerts are a match made in heaven. Our designers excel at choreographing displays to your music. We have a wide range of stage pyrotechnics and special effects which add drama throughout your show. For blockbuster events, our dramatic finale's and pyrotechnic wizardry will leave your audience spellbound. We have worked with world famous bands and musicians in huge stadiums and intimate clubs. Christina Aguilera, Dame Shirley Bassey, The Rolling Stones and The Red Hot Chili Peppers are just a few of the names that spring to mind. Summer finds our teams touring the length and breadth of the U.K. bringing our special magic to local music festivals and charitable events. 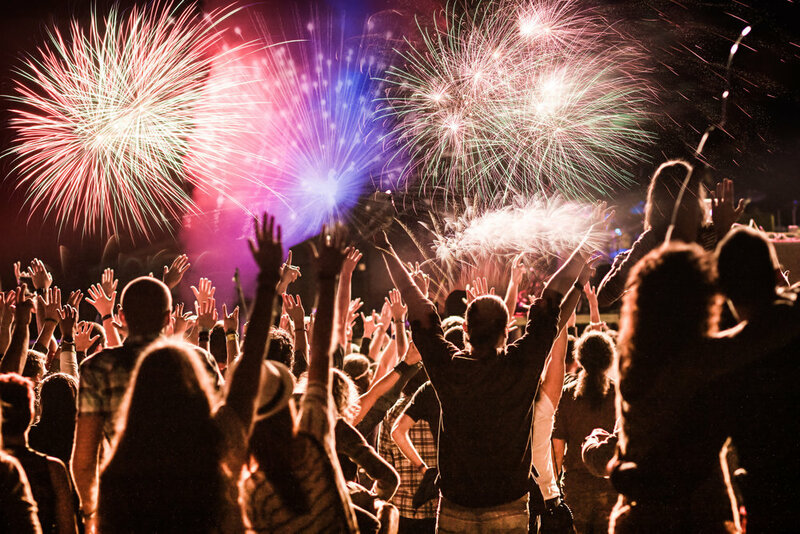 Contact us if you think fireworks would enhance your concert. Fireworks at a rock concert. When The Red Hot Chili Peppers announced a UK stadium tour, there was one thing they were certain of – they had to have fireworks! Their production company came straight to Star Fireworks and explained the band wanted fireworks at the end of their shows, to appear behind the stage so that the audience could see them clearly. Our designers jumped straight on a plane and flew to the first location, Edinburgh’s Murrayfield Stadium – a massive, imposing structure with a roof-line which called for some careful planning to ensure the audience inside could see the fireworks. The fireworks would have to be fired from a piece of land normally used for parking. The height of the roof was not the only challenge, the stadium is based in a residential area with public parks right next to the firing site. With trained Star Fireworks pyrotechnicians based right across the country, we were able to use local crews in keeping with our local and environmental values. Our teams managed all logistics and worked closely with the local authority and stadium management to ensure the safety of the public at all times. Our show for the Chili Peppers at the Etihad Stadium was particularly extravagant. Fired from a plot of wasteland at the rear of the stadium which was ear-marked to later become a hotel, the show was a massive hit. Rigging of the computer-fired show commenced at 8 am, and final tests were carried out at 6 pm. With the fireworks ready in a security patrolled zone, our crew were able to sit back and enjoy the concert until firing time, when the biggest fireworks display to appear at the stadium since The Commonwealth Games, lit up Manchester’s night sky. The crowd erupted with a huge cheer of appreciation for the Chili Peppers’ surprise pyro-spectacular. Every firework fired as expected and the production company were delighted with the thrilling show.